Elgin, Texas — On February 6, Austin Community College (ACC) celebrated the opening of Phase II on their ACC Elgin campus with a ribbon cutting ceremony and reception that included self-guided tours of the new spaces for their Sustainable Agriculture Entrepreneurship and Veterinary Technology programs. 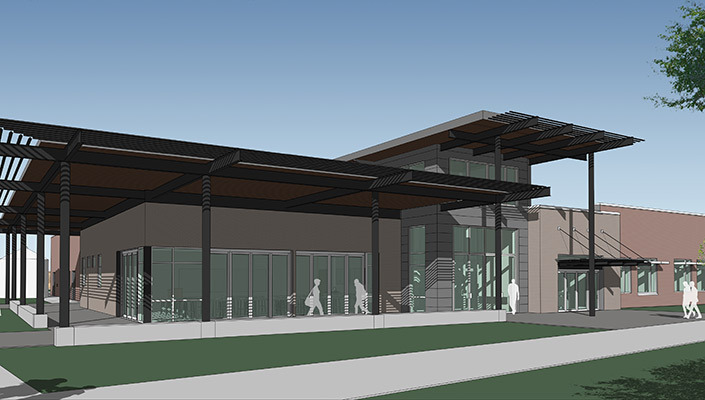 The design concept includes a 18,500 SF academic building and 11,000 SF outbuilding to be shared by the two programs. The buildings are designed to effectively balance the unique needs of both degree tracks with indoor and outdoor spaces that include classrooms, labs, animal wards, treatment and surgery areas, a tractor maintenance bay, crop washing and storage spaces, and kitchens to support farm-to-table initiatives. The 98-acre campus also includes permanent pasture land, orchard space and a rotational crop field. Following 2014 voter approval for capital improvement projects, O’Connell Robertson developed a master plan for growth of the Elgin Campus. In Phase I the college gained a comprehensive campus classroom facility to serve 1,500 students. With Phase II, the plan evolved to support the added educational programming and courses that led to the uniqueness of these two facilities. Open now for the Spring 2018 semester, Phase II represents significant completion of the campus master plan and complements the Phase I general education building. O’Connell Robertson provided architecture, MEP engineering and interior design services for both projects.